Saving for your child's education is something some people start when their child is born, which isn't a bad idea. It's always good to get a head start, especially when considering inflation. Over the past several years tuition inflation has been more than double general inflation. Many parents save in 529 plans. There are two types: college savings plans and prepaid plans. The prepaid plans are guaranteed to increase in value at the same rate as college tuition. The plan will pay the average in-state public college tuition if the student decides to go to a private or out-of-state institution. However, there are contribution limits to 529 plans. Variable Universal Life Insurance To The Rescue? Variable Universal Life (VUL) is permanent insurance, it's in force during the lifetime of the insured, as opposed to term, which is effect until the term runs out, or the insured dies, whichever comes first. Permanent life insurance is more expensive than term and the premium is split between the cost of the death benefit, fees to the insurance company and the tax-advantaged cash value portion of the policy. The tax advantage is the growith of the cash value is tax-deferred. What makes VUL unique is the insured has the option to invest the cash value in stocks. So Why Use VUL For College Savings? The policies are very complex. State insurance officials and the SEC allow sales reps to claim 12% annual earnings growth in the cash value account. If the account loses value right before your child enters school, you're out of luck. It's a wise idea to begin converting funds invested for college to liquid accounts as the student approaches college age. That way the funds are safe. 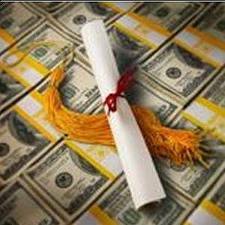 If you try cashing in the VUL, then the money will be used in the financial aid calculation. Unless you have a strong stomach for such things, perhaps using a VUL policy is not the vehicle for you to save for your child's education. You might want to stick to a prepaid 529 Plan. When do you think is the best time to start saving for your child's education?